Mineola High School Physical Education Leaders visited with their younger counterparts at Jackson Avenue School. The Leaders worked with third-graders to teach an interactive lesson surrounding mental health and the importance of an active lifestyle. The student-athletes also played games with the younger students and incorporated fun exercises during their class lesson. 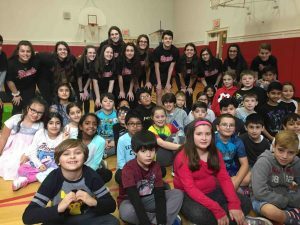 Photo caption: Mineola High School Physical Education Leaders visited with their younger counterparts at Jackson Avenue School.